Yes, you're seeing correctly that's a fish holding a martini glass. This is my favorite bar in all of Chicago. I used to live about 5 blocks from this place up in Andersonville. Andersonville, is the old Swedish neighborhood around Clark and Foster. This bar was filled with people from the 'hood-old Swedish guys, actors, girls who like girls, boys who like boys, and the occasional frat boy. Usually they were there with me. This place has a great jukebox. I remember being in there one night with NickatNite drinking the Swedish version of Jaggermeister and talking the bartender into only playing Neil Young's Trans album. Now, that record is horrible and only a true Neil Young fan can tolerate it. It scared away most of the patrons. You gotta love a bartender that will take care of his regulars like that. 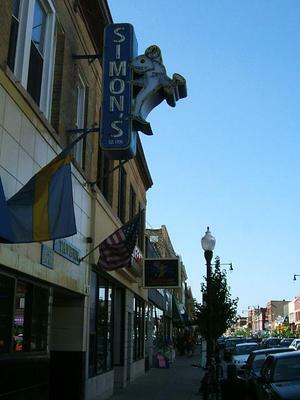 I'm looking forward to going to Simon's and enjoying a nice burrito from Don Quixote to end the evening. I should feel like a million dollars all in nickels by the time Friday rolls around. 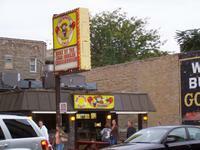 This my friends is The Weiner's Circle-perhaps the best hot dog in Chicago. It is on Clark just south of Diversey. There is something about a Chicago-style dog which makes it so damn good. Maybe it's the Vienna dog itself-so good with just the right amount of salt. I highly suggest getting one with pickles, relish, tomatoes, and of course mustard. 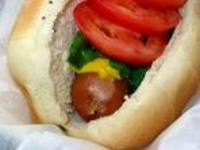 What is with people who put ketchup on their hot dogs? Gross. The Circle is open till the wee hours of the morning. I have seen the sun rise from the picnic tables out front. My boy STS and 3 of his peeps lived around the corner from here. You could see the sign from their back deck. How do I know this? The keg was always out there and I spent lots of time by the keg. These boys were notorious for having rager house parties. Usually themed. The last one I went to was an 80s party complete with Bartles and James berry breeze wine coolers, various 80s bands LPs suspended from the ceiling, and one of the hosts having his hair like A Flock of Seagulls. For straight boys they sure could put together a theme party. Now they are all married or coupled off and the theme parties are long over. I'm thinking about having a dog as a warm up course before I head out on Thursday to meet up with the Savage. Who I might add called me today at work and said "Jackass, what time does the eagle land on Wed? I will see you at Simon's, Thursday at 8. Don't be late." Jackass? that seems a little harsh. *Yes, that's right the sign on the wall next to the Circle says "We Buy Gold". It is a sweet pawn shop. I picked up a killer Onkyo receiver dirt cheap when I blew a channel in mine.